This entry was written by Sarah Jenkins, posted on 04/22/2015 at 9:54 pm, filed under April 2015 category. We rose extra early to meet the bus, and are greeted by Avi, one of Israel’s foremost guides with 44 years of experience. 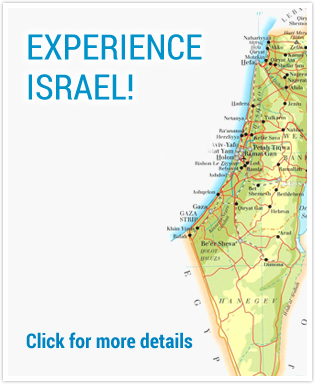 He is a veritable biblical encyclopedia and a great teacher – he also is Yuval’s father, and did not hesitate to tell the group that he taught him all he knows about being a tour guide. We began our first full day in Jerusalem at a private garden, across from the traditional site of the Garden of Gethsemane. We are lucky enough to have beat many of the other groups to the site, and have the garden almost to ourselves. 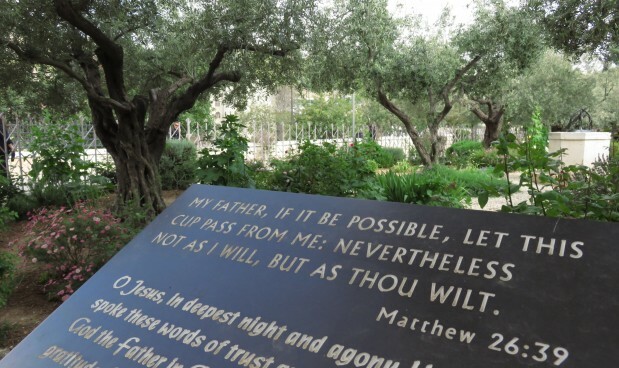 The Pastor reminded us that Jesus prayed an agonizing prayer in this garden the night before he was crucified – the ‘pain of grace’ (Matt 26: 36-46). We were given time in this solemn garden to pray privately and reflect on the significance of this place. In the days ahead after we return home, we will always remember being able to pray in this special spot. We walked into the Old City through the Lions Gate where Saint Stephen was killed, becoming the first Christian martyr. He forgave his aggressors and as he lay dying, reported a vision of Jesus at the right hand of God. He would have been looking up at the Mount of Olives, the place where Jesus ascended into heaven (Acts 7: 54-60). Our next stop was the Pool of Bethesda, a public pool known as a place of healing. Legend has it that if you were the first to enter the water after it was stirred by an angel, you would be healed. Jesus came here and healed a crippled man demonstrating that it was by the power of Jesus, not the water that offers hope. We had prayer here for a special person at home named Norma who needs God’s healing touch. We walked a short distance to the Church of Saint Anne, built over a grotto and believed to be the birthplace of Mary, mother of Jesus and is dedicated to Anna and Joachim, her parents. This church was completed in 1138 A.D., making it one of the oldest churches in the world. It is one of the very few that survived intact after the many battles for Jerusalem. The acoustics here are nearly perfect as Avi, our guide led us in singing ‘How Great Thou Art’; several of the group sang ‘Holy, Holy, Holy’ – what a worshipful experience! It was amazing to listen to the voices of our group reverberate in this ancient church. We then walked through the Arab quarter of the Old City on our way to a site beneath the streets known as “the place of the pavement,” or the Praetorium. This is the very spot where Jesus was brought before Pilate. We stood on the actual pavement where Jesus stood! Mark Jenkins shared the account of Jesus before Pilot from Matthew 27: 11-27. He pointed out that at Passover, there would have been many people in Jerusalem from many countries. It could have been our ancestors who cried ‘let the blood be on us and our children’. That blood is either condemnation for those who reject Christ or redemption for those who accept Jesus as the Messiah. From this place, a weary and already beaten Jesus would be mocked, scourged and then led away to Golgotha and His crucifixion. Pastor Mark underlined the verse that said let his blood be on us and our children, citing the fact that our ancestors were represented here and that Jesus’ blood is on our hands. This is actually a blessing for those who accept Jesus as our atonement but condemnation for those who reject Him. Pastor Becton was invited to pray, and then we sang “We are Standing on Holy Ground”. We stood in silence for a long while . It was a significant moment for our group in Jerusalem – it is truly overwhelming to realize where we stood! Thankful to be back in the sunshine again, we heard sirens as we exited, and once again, the country would stop and pay respect for those who have given their lives for this country. We exited the Old City through the Damascus Gate and headed to Notre Dame Chapel, where we once again had a special invitation from Father Kelly. We were in awe of the feeling of reverence in this structure that is operated today as a guest house. We had a wonderful lunch and saw items related to the Shroud of Turin. We were then taken up to the rooftop where we had excellent views of the City of Jerusalem. Father Kelly gave us a geography lesson and a three-minute overview of the Bible from that vantage point – that was awesome! It was an incredible experience, and we are extremely grateful to our host. Back on the bus, we headed to the City of David excavations – some of the latest archaeological excavations in Israel, thought to contain the earliest structures in Jerusalem including David’s palace. These structures date back 3000 years and provide further evidence to Jewish claims on the land. We walked on an old city street that dates back to the time of Christ. Jesus would have walked along this very street, from the House of Caiaphas to the Praetorium (‘the place of the pavement’). There were also some stones there that had fallen when the Temple was destroyed in 70 A.D. Some of our group wanted pictures taken touching these stones. Avi led us over to the ancient entrance to the Temple Mount known as the Southern Steps. This is where all those making pilgrimage to Israel during the feasts would have entered the Temple Mount. There are remains of many ritual baths in this area. You had to be clean to enter the temple grounds. We walked to the top of the very steps that Jesus probably walked and took lots of pictures. These steps are built so that you must come up and leave the Temple slowly. Pastor reminded us how we race to church each Sunday and to take this concept back with us – to worship Him for who He is. After our time on the Southern Steps, Avi led us to the Ha-Kotel or the Western Wall of the Temple Mount in Jerusalem, the holiest of Jewish sites, sacred because it is a remnant of the Herodian retaining wall that once enclosed and supported the Second Temple. It has also been called the “Wailing Wall” by European observers because Jews have gathered here for centuries to lament the loss of their temple. Mark encouraged us to go and pray for Israel and for the Jewish people. To go to the wall, our group divided – the men go to the left and the women go to the right. When we reached the wall, we saw the many written prayers people have placed in the cracks. We offered our prayer as we hear the whispers – the prayers of the many Jews who come here to pray. What a wonderful place to end our day of touring! Back to the hotel for a little rest and food, then most of the group headed to Ben Yehuda Street to join in the festivities of Independence Day. Memorial Day ended at sunset or around 8 p.m., and then the celebration of their independence began! We saw people getting sprayed with shaving cream and other ‘fun’ stuff! What a party!